Many articles have been written on firearms in regard to home defense detailing the best choice of weapon in type, caliber, configuration, and probably a few other categories. It is a popular topic, and one that is worthy of consideration so we will dedicate a blog post to the subject. There may exist a better weapon (handgun, shotgun, etc...) for home defense for some particular applications, but DTI manufactures AR-15 rifles and markets AR-15 parts and accessories, so the information in this post will be limited to the AR-15 platform. The AR-15 rifle can be the best choice of firearm for your particular home defense application. Rifles have the capability of neutralizing threats at a greater range than pistols or shotguns. If the threat is a human being with the intent to cause you or others harm, this benefit needs to be weighed against possible negative consequences such as where each fired projectile goes when it leaves the weapon (collateral damage of any type), and whether the use of deadly force to defend you or others was truly necessary at the distance the threat was engaged. But threats are not limited to human beings with harmful intent. If you live in a rural location, as I do, there may be non-human threats to humans and property. The distance capability of a rifle may be a benefit that could make the AR-15 the best choice for a home defense firearm. It all depends on your particular application. Another example of the AR-15 rifle being the best selection for your particular home defense needs is when it is your only weapon! 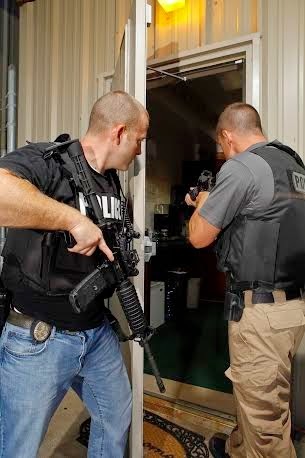 The considerations mentioned above in regard to using it in a home defense/deadly force scenario still need to be applied, but if it is your only weapon, or the best weapon in your limited inventory, then it is the right choice. It is possible that some media professionals that have offered opinions on this topic have forgotten there are still many individuals who have a limited and thoroughly allocated income and may have a limited arsenal as a result. Additionally, the substantial benefit the AR-15 platform has in being modular and easily configured for many applications is the very reason it may be the only weapon available to an individual for a home defense application. The point of all this: it is a fine choice for home defense, and it may be the best choice for home defense for a particular environment and application. Any AR-15 can serve in a home defense role. A rifle with a shorter barrel is definitely going to be easier to use in the confines of a building or in dense vegetation on your property, so this may be a consideration if you are in the market to purchase an AR-15 for this purpose. A 16" barrel or a 14.5" barrel with a permanently attached muzzle device that makes the overall barrel length at least 16" is the minimum that you can own and use without going through the process of obtaining a SBR permit (short barreled rifle) from the federal government. An AR-15 with a 16" barrel can work just fine as a home defense weapon. Having a collapsible buttstock is also something to consider; it can reduce overall length to make the weapon easier to use in confined spaces and allow multiple possible users in your home to comfortably and accurately employ the weapon in this role. The AR-15's modularity benefit was mentioned earlier (modularity=designed for flexible arrangement and use). In the past, there has been a trend to take this benefit to an unbeneficial end. The AR-15 platform has more available accessory options than any other weapon system. A railed handguard has a lot of "real-estate" that can tempt a user to fill every section with something that usually fits in one of 3 categories: necessary and helpful, potentially helpful, and "cool". I urge you to resist this temptation and thoughtfully consider what you need for home defense (or apply this to any other application for which you may use the weapon). For home defense, a light is a must. It is very possible that a defense confrontation may occur in low light and you must be able to identify what is a threat and what is not. There are many gun mounted light options that have function features such as "momentary on" and strobe effects. These can be helpful features to have, but using them mandates training with them. You need a gun mounted light for a home defense AR-15, but that doesn't mean you need a railed handguard. Many standard, two-piece style handguards can have small picatinny rail sections mounted on them in locations that best allow you access to manipulate the light. Accessory rail sections can also be mounted to the front sight base or gas block or the light can be mounted to a vertical foregrip that is mounted to a rail section on a handguard. An AR-15 designed for home defense use should not be a heavy, unwieldy weapon. Get a light and keep it light, with only the necessary modifications and accessories. ﻿﻿﻿﻿﻿There are many different options and accessories with which to configure a home defense AR-15; apart from a light, the only enhancement which I consider being near necessary is a red dot style optic. Yes, iron sights can work just fine, but for quick target acquisition in most lighting conditions at most home defense distances, the red dot/reflex style of optic is hard to beat. This type of optical sight is great for close quarters combat, and many brands are inexpensive--but therein lies a potential problem for their usefulness in a home defense application. Anything, ANYTHING one may consider using for this role should be easy to use and dependable. The red dot optics that are the least expensive tend to be the least dependable and least easy to use. Trijicon and Meprolight optics may be somewhat expensive, but need no batteries and have reticles powered by fiber optics and tritium (for use in very low or no light). These are great choices for a home defense AR configuration and you never have to worry about their power source or turning the units on; however they tend to have fairly large reticles and may not be as bright as battery powered optics. These characteristics can be a positive or negative feature, all depending on your preference and application. 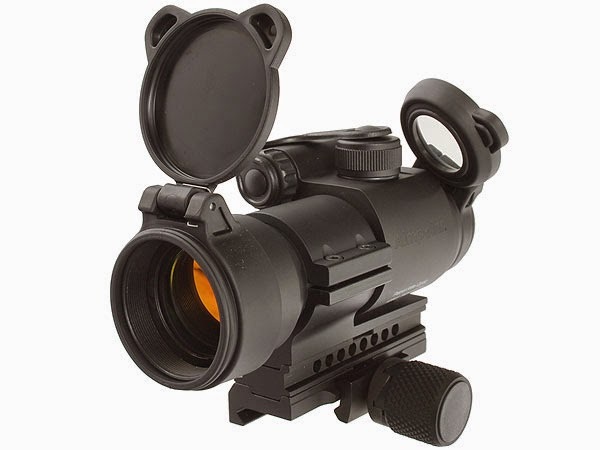 The Aimpoint brand of red dot optics have a similar pricepoint, but they are battery powered. Like the Trijicon and Meprolight optics, they are simple and dependable, and are in use by law enforcement and military units worldwide. Aimpoint's ACET technology allows the optic to be left "on" for a couple of years before a battery change is necessary. In any defense encounter where the use of deadly force may be necessary for your protection, fine motor skills have a tendency to not be so fine. Trying to find a power button, brightness level adjustment, and similar required adjustments can be difficult, so this feature is a real plus. There are other quality optics that are less expensive, and some that may be equal or better that are more expensive; but, if you have the financial capability, Aimpoint optics are dependable, easy to use, and are worthwhile investment for a home defense AR-15 (and for many other AR-15 applications as well). 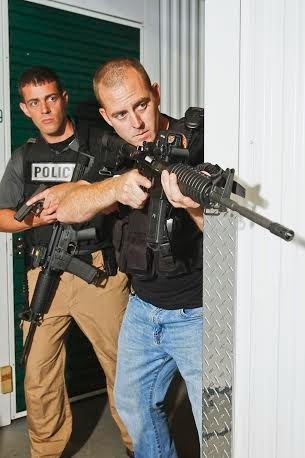 Many different online and print-media articles and reviews have presented information and perspectives on the use of an AR-15 rifle in a home defense application. After reading/hearing the multitude of reasons why an AR-15 is not a good choice for this role (even vehement statements of why it should never be used in this role), it was my aim to offer some perspectives on why it may be, can be, or is a smart and valuable selection as a home defense firearm. Thanks for reading our blog. If you have any questions about the DTI AR-15 rifles we manufacture or the AR-15 parts we offer at www.del-ton.com, please feel free to contact us.